The Third Penang Food Bloggers (Floggers) Potluck Meet at Gill & Jason’s Place on 6 December 2008 was another great experience for many. 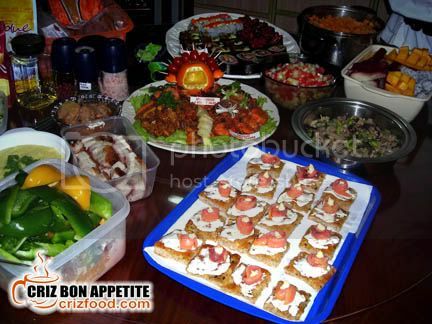 The food was so wonderful that I do not think anyone else would ever experience such an international spread. We had food ranging from Western, Japanese, Korean, Malaysian, etc. This would not have happened if it were not the effort of everyone who had sweated it out in the kitchen to come out with something great to make the gathering such a success. There were all together 12 attendees at the gathering from 10 food websites. To start the ball rolling, let me start with what I had bought to the gathering. 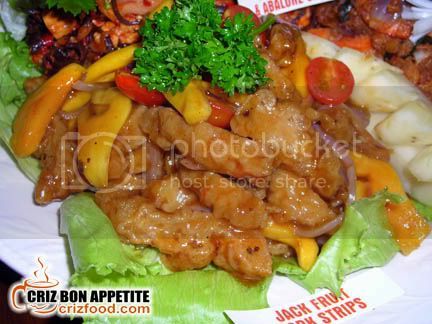 Criz Lai of Criz Bon Appetite – Western & Oriental Fusion (Nutmeg Cherry Tomatoes / Spicy Chicken & Abalone Salad / Jack Fruit Pork Strips / Fragrant Sambal Prawns). I had a fun theme for my self created recipes. I had the cherry tomatoes stuffed with sugared nutmeg strips. Each tomato had a mild tomato taste with a touch of the sweetness from the stuffed nutmeg strips. The Spicy Chicken & Abalone Salad was quite a blast with the floggers. It contained some roasted chicken chunks, fresh Pacific abalone slices, wood ear fungus, ginger flower, kaffir leaves, dried grated coconut, roasted sesame seeds mixed with chili paste, dried shrimp powder and lime juices. The stir fried Jack Fruit Pork Strips was another hit for a few floggers. It had a mixture of fresh jack fruit strips, turmeric flavored pork chop slices, cooked with some special sauce with a touch of Shao Xing wine. 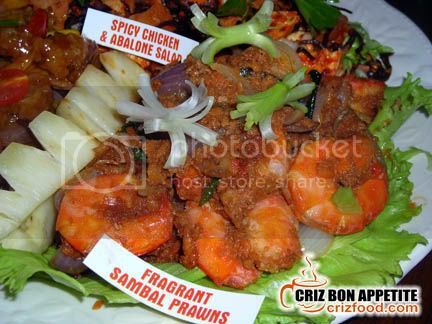 The Fragrant Sambal Prawns was cooked with a fusion between Indian and Nyonya Style. Some large prawns were cooked in sambal hae bee (spicy pounded dried shrimps) with onions and curry leaves to bring in that special fragrance in the dish. 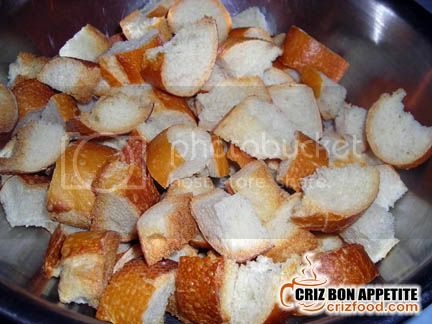 Jason & Gill – Cheese Fondue with Baguettes / Salsa Salad / Lemonade with Pomegranates. 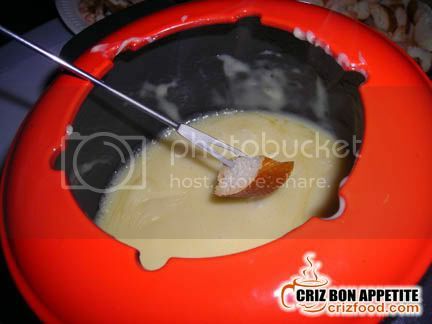 Our loving couple came out with Cheese Fondue, imported directly from Europe. The frozen mixture has that unique liquor taste in it. Although the alcohol content is not that intoxicating, I love it best with the fresh German sausages Ken brought. 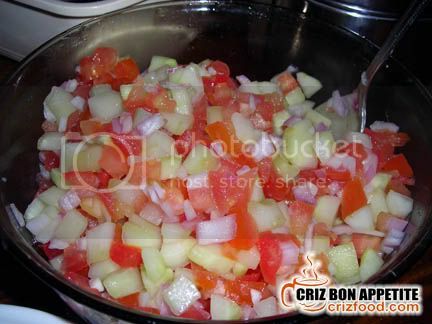 The Salsa Salad goes well with the meaty dishes as it has that pungent and sour taste in it – a great appetizing salad indeed. Sorry to say, I forgot about taking shots of the tasty lemonade drink. 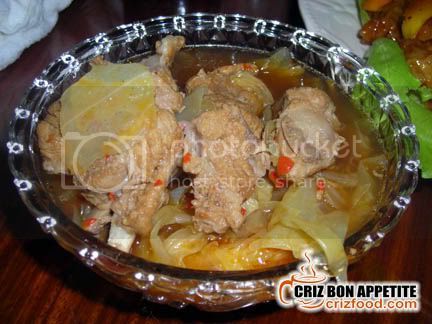 Ken Chan – Cantonese Style Spicy & Sour Pork Ribs / Fresh German Sausages / Roasted Stuffed Chicken. Ken brought a whole pot of the sour pork stew. It has a mild touch of some herbs with lots of cabbage. The pork ribs were tasty and tender. 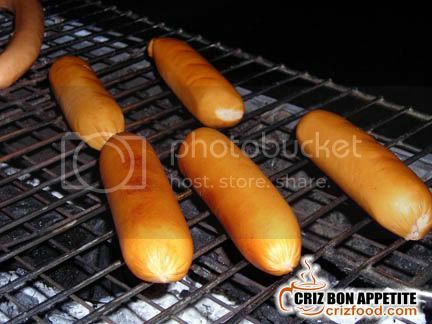 The fresh German sausages which Ken brought all the way from Kuala Lumpur were huge but juicy. We even have a small BBQ area for that. 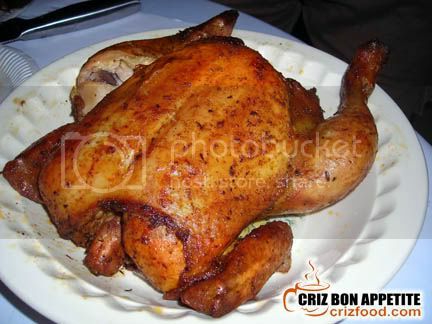 The Roasted Stuffed Chicken took quite some time to be defrosted and roasted to perfection. The waiting time was not disappointing at all as the meat had all the herby taste from the coating and ham stuffing absorbed deeply into the meat. 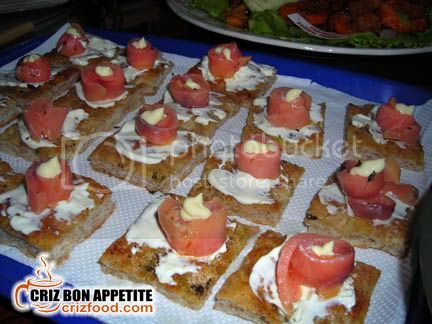 Lilian Chan – Smoked Salmon & Herb Focaccia Appetizer. Lilian did a great job by creating her own herb focaccia bread for the gathering. Her dish has a spread of mayonnaise on the bread slice and topped with a rolled smoked salmon and some cream cheese. It was something great that you won’t get from any buffet appetizer menu. 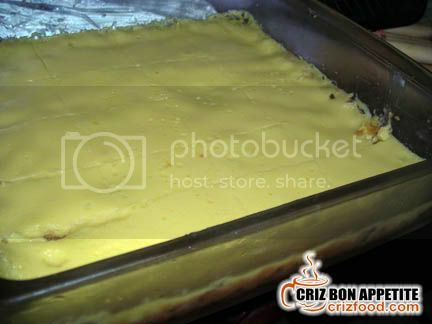 Lingzie of Lingzie’s Tummy Treats – Cheesecake Brownies & Lime Pie. 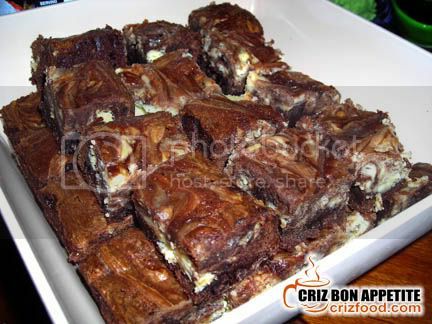 The Cheesecake Brownies Lingzie made was rather rich. It has a thick chocolate taste in it. Sweet for some but it was a lovely treats for us. Although the Lime Pie was rather soft and sour in taste, it was very appetizing. It has crushed digestive biscuits as base, baked eggs, condensed milk and lime juice as topping and was served with whipped cream. Simply delicious! I even had three helpings to the dessert. Steven Goh – Kimchi Fried Rice. The Kimchi Fried Rice was tasty. 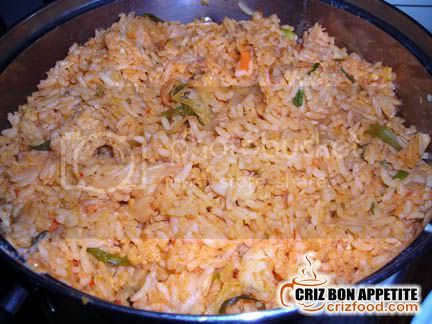 It has lots of chicken meat and prawns in it and the overall combination of the Kimchi with rice was just right. 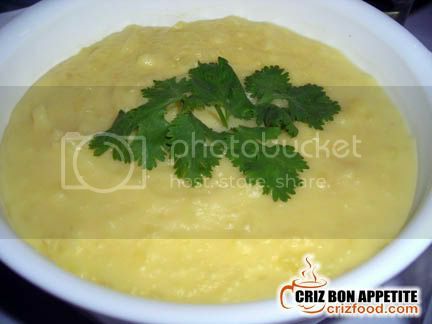 Allen Ooi of Yummy Station – Mashed Potatoes. Allen tried his best to come out with a recipe he had not tried before. That was a good effort indeed. The Mashed Potatoes was quite nice, although it could be slightly improved with some added sour cream and black pepper to make the dish more creamy and spicy. Min aka 550ml Jar of Faith of After Giovanni – Hakka Dish (Stir Fry Sohn Pan Tzai – 算盘子or Àbacus Beads) & Disposable Utensils. Min, also came all the way from KL, came out with a rather unique Hakka dish – Stir Fry Sohn Pan Tzai. The dough is formed by mixing tapioca and yam, cut into abacus-bead shapes and boiled until it looked translucent. 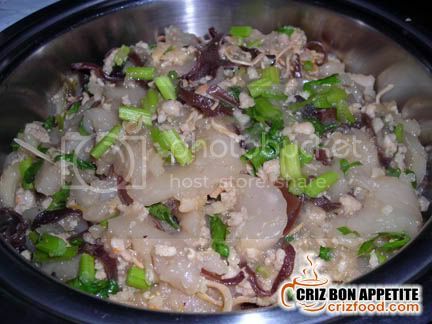 The cooked dough is then fried with sliced cuttlefish, dried shrimps, wood ear fungus, some chopped celery stalks with a touch of light soy sauce, sesame oil and some seasonings. The taste was great as I had never tasted this Hakka dish before. The gathering sure did foster closer relationships amongst the floggers. I could not wait for the next gathering. Most probably it would be held after the Chinese New Year which will fall on 26-27th January 2009. We guessed right! You were the first to blog about the gathering. Too bad you all left too early. We(Me, Gill & Ken) were still going until 1:00am++. very efficient leh, some more got review of all the foods. It was a great occasion where everyone of us had a chance to try out food from all around the world. The drawback is that the portion of estimation are too much. Next time for 16 person may be we go for 5 person will do. You’re making me drool all over my keyboard!!! Aiyoh!! too much food leftover uh? because lacking one hungry ghosts like me uh?! 🙂 Criz, the dish you prepared looked like wedding dinner one hor?! 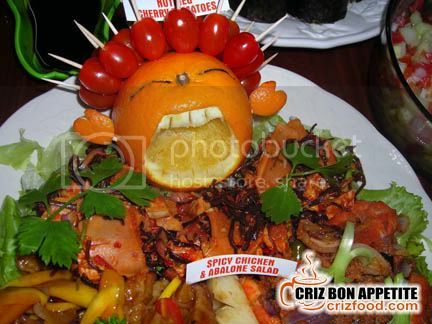 :p I like the orange with tomato face!! 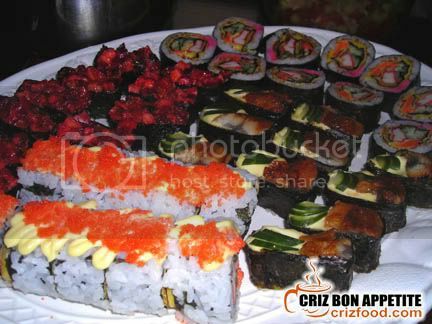 Thanks for the chopstick Criz and for your mix starters. It taste really nice. Your new blog design are quite cool too …. It was so great to finally meet everybody! And with such an abundance of great food to boot! Thanks for the chopsticks Criz! And remember to post up the recipe for your dish! aiyo… so bad liao…… i din go…. sien liao………. ps: i like tat orange tomato cute face !! so creative! aww … came back from KL and the 1st thing I read’s this gathering which I missed again. hmmmm …. no luck at all. The orange face you created is so cute! i am salivating all over again looking at your photos and thinking of the food that night! it was indeed a wonderful spread! waiting for your innovative unique recipes! 🙂 those chopsticks were a really nice souvenir too, a really nice touch! kam siah! wow really lots of food. 🙁 i’m not too good in cooking though. Well… you could always get your mother or whoever good at cooking to cook right? 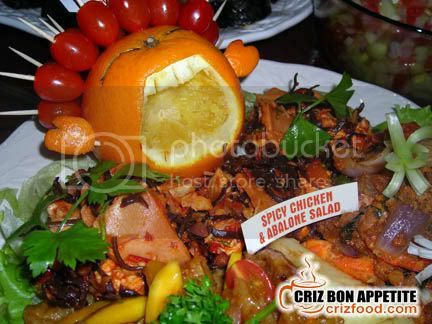 Very creative and original with style with that orange..like it very much. It’s great to see Penang floggers occasional holding such get togethers, indeed foodies of class and style. OK OK, now I come to left some comment. I was quite sick on that night. Too bad I missed most of the food. I only tested one portion on yours. Some I even not tested at all. If I continue to eat, I will vomit in the end. Hahahaha, I have the vomit feeling, that is why I stopped while you all are still eating. I have nothing to say on your food. It was just fantastic, especially the presentation. I need to try harder for my cooking skill so I can cook better next time, if we have another session of pot luck. Haha. No wonder you looked so pale that night. Get more rest ok? 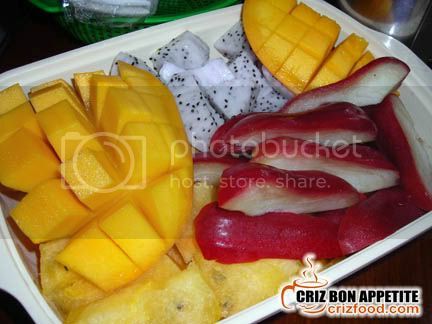 It reminds me how the Thai and Vietnamese people also like to make their unique and creative fruit crafting. WOW! What a spread! Ermm…maybe next time can extend the invites to floggers from KL? OMG! TorAa sent me over here since he know how hungry I always are and I must tell you: I’m drooling heavily now! Someone, throw my a towel! This is a food feast of no comparison… Yummy, yummy all the way through – both for the taste buds and the eyes! You put so much effort in preparing the food…well done! but too bad that I missed the gathering 🙁 when is the next gathering? Sob sob~ You even missed my launching. 😛 The next one should be in February 2009.